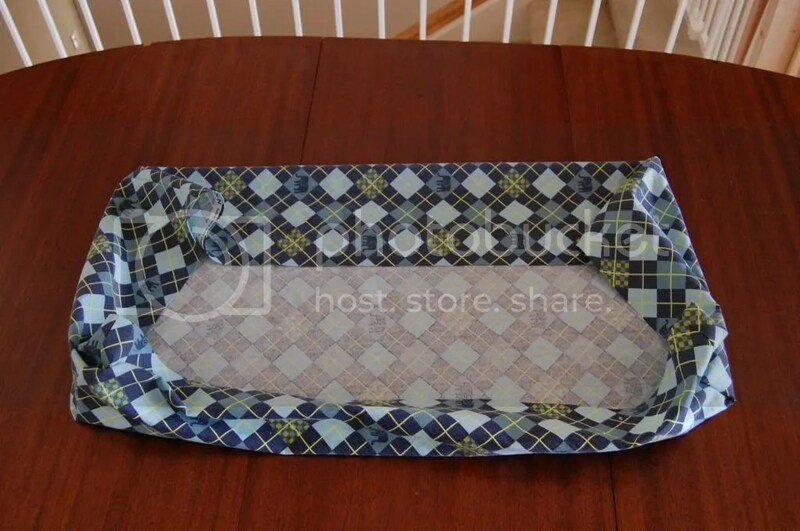 Last week, we left off with a fabulous Lego shaped piece of fabric, which didn’t quite look anything like a changing pad cover. If you missed it, click here to read the first part of this tutorial. 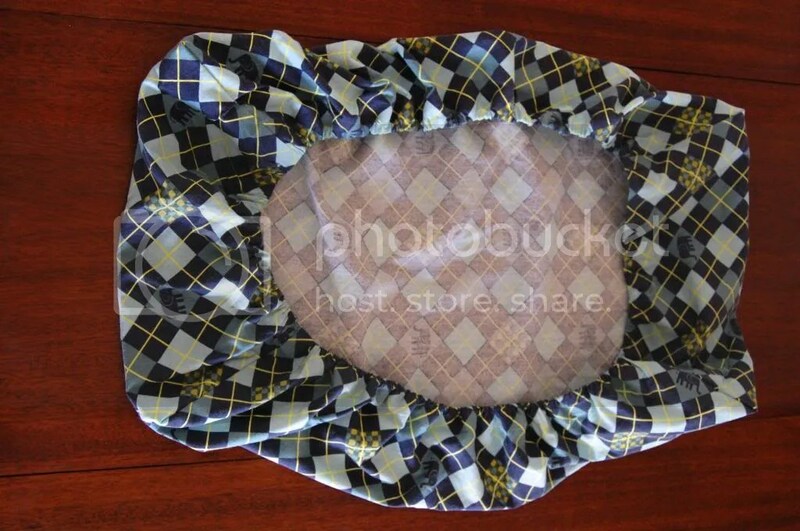 Today, we’re going to turn that piece of fabric into a changing pad cover. Now comes the tedious fun part! Wait, it should all be fun, right? Go ahead and do some quick prep work before you jump into this next section. It just makes things go a bit quicker once you get going. 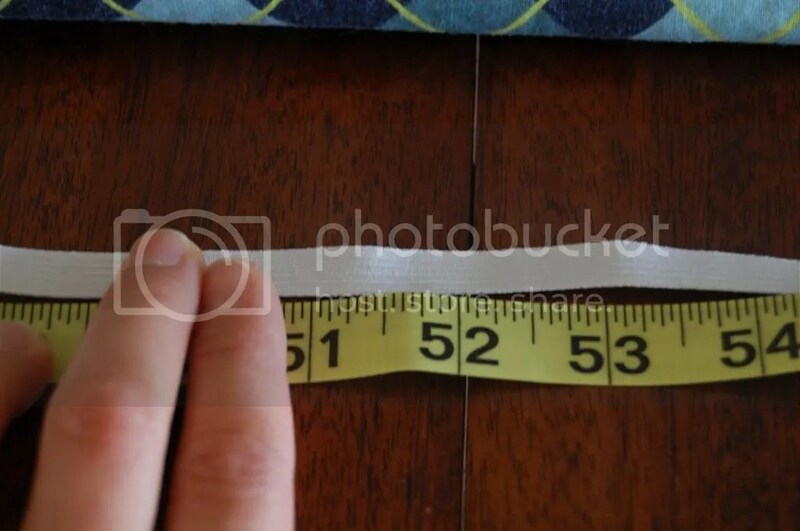 Cut one 52″ length of elastic. Cut one 12″ piece of thread and thread onto the needle. Make sure you knot at the bottom once threaded. 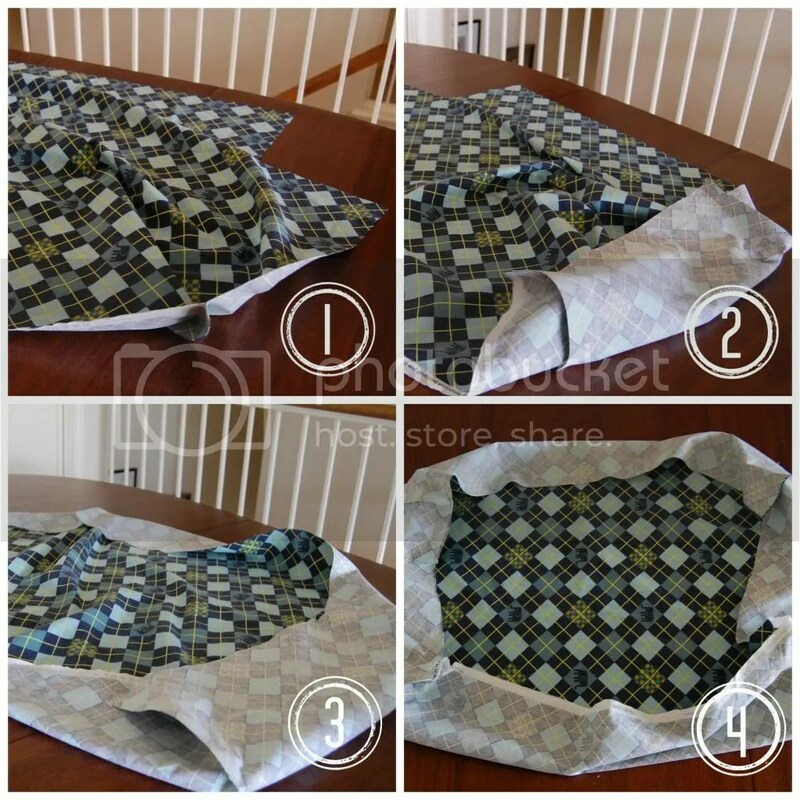 Take one of the 8″ pieces and lay it on one side of the fabric where you cut out the 8″ x 8″ square. It doesn’t matter if you place it on top (as pictured below) or if you place it on the side. Either way, you’ll be folding over the opposite side onto the Stitch Witchery. Here’s a blurry action picture of laying one 8″ side on top of the opposing 8″ side. All I did was grab the left side without the Stitch Witchery (as seen right above), pull it up and over to lay it on the opposite side. Make sense? And this is what it looks like right before ironing down. 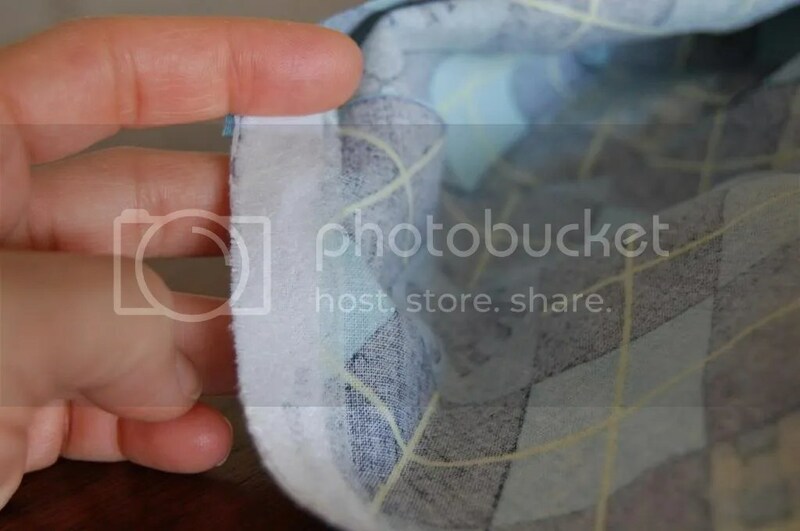 Following the directions on the Stitch Witchery package, cover the seam with a damp cloth. 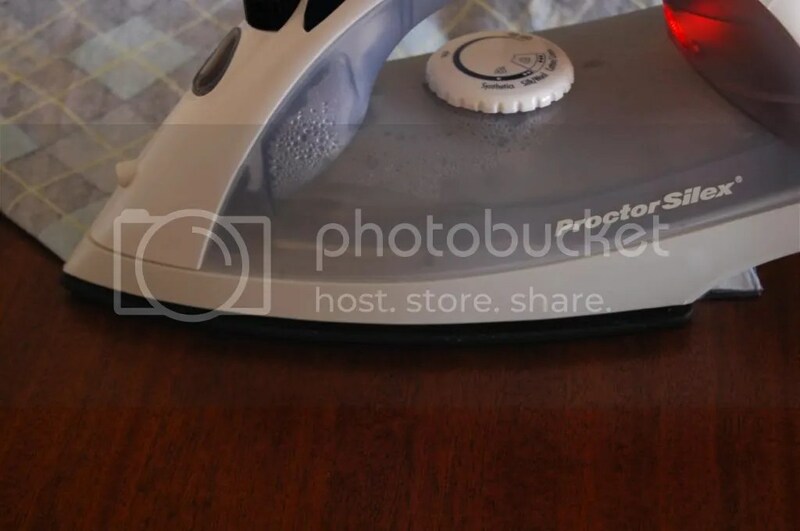 Using the steam setting on your iron, press down for 10 seconds on each side. Do not slide your iron! There are very clear instructions on the Stitch Witchery package. The key to a successful bond is following these directions. 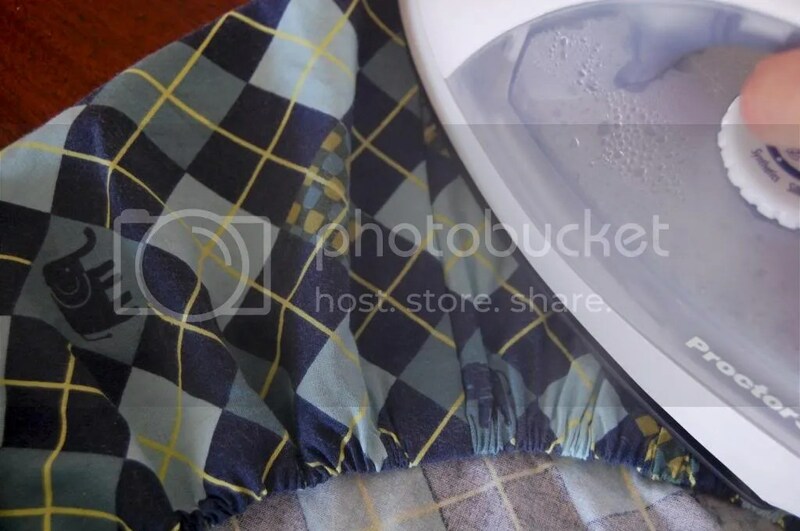 I thought I would be clever and save some time and effort by skipping the damp cloth but learn from my mistake….don’t skip it even if my picture below doesn’t have the damp cloth. Ok, now you’re all done with following the directions (I think I’ve gotten my point across?) on the Stitch Witchery package and you have a lovely finished seam like so. Repeat this same process for the remaining three corners of your fabric. You’re more than halfway done now! If you see step 4 in the picture right above, you’ll notice the edges of the cover are unfinished. In other words, there is no hem yet. We’re getting to that in this next step. 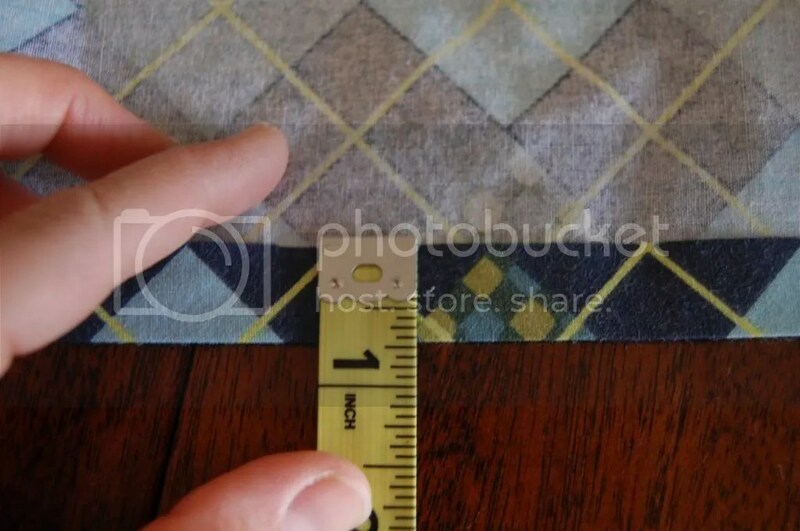 Measure a 3/4″ to 1″ section out around the entire diameter of the fabric. 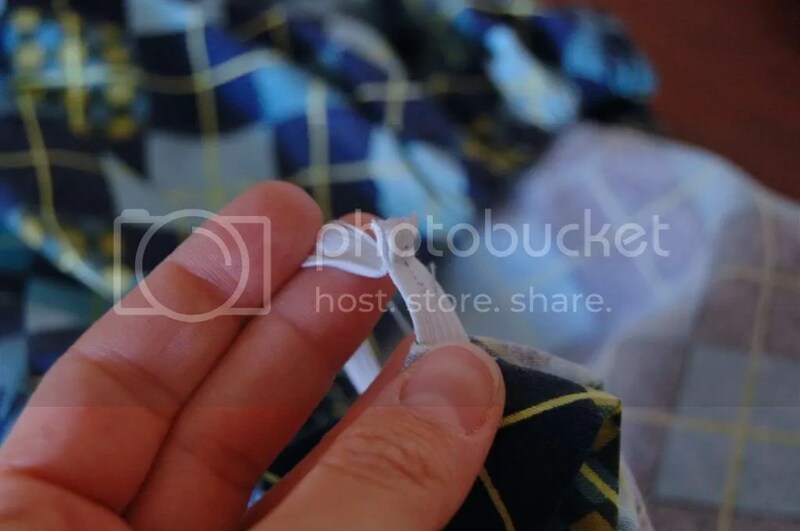 In the picture below, you’ll see it’s right at 3/4″ but after snapping the picture I decided to go ahead with a 1″ hem because it was easier to work with. You’re going to include the corners in this as well, so make sure you fold it down evenly. This part is easier to do as you go, since you’ll be ironing the hem before actually securing it with Stitch Witchery. Having a pre-ironed hem makes it lots easier! This is what your ironed 1″ hem looks like before affixing the Stitch Witchery. 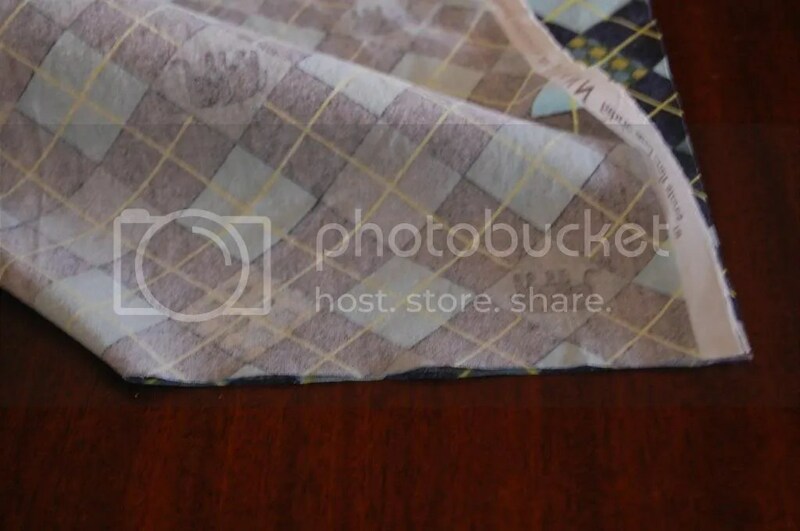 By the way, if you wonder why I use a 1″ hem it’s because the Stitch Witchery measures 5/8″ wide and I want to make sure my hem is wider than the bonding web. If not, you will have a sticky mess when the iron touches the Stitch Witchery if it’s peeking out under the hem. Trust me, that’s not fun to clean up. You can start with the longer side or the short side – it doesn’t matter. Remember those pieces of Stitch Witchery you cut earlier? Yup! Now is the time to grab a piece (let’s say you’re starting on the long side first — grab one 30″ piece) and slip it underneath the pre-ironed hem you’ve just made, starting at one corner. Below, my pointer finger is at is right at the corner seam. Iron that bad boy down, bit by bit. Remember what I said about using a damp cloth? Do as I say write and don’t do as shown below. 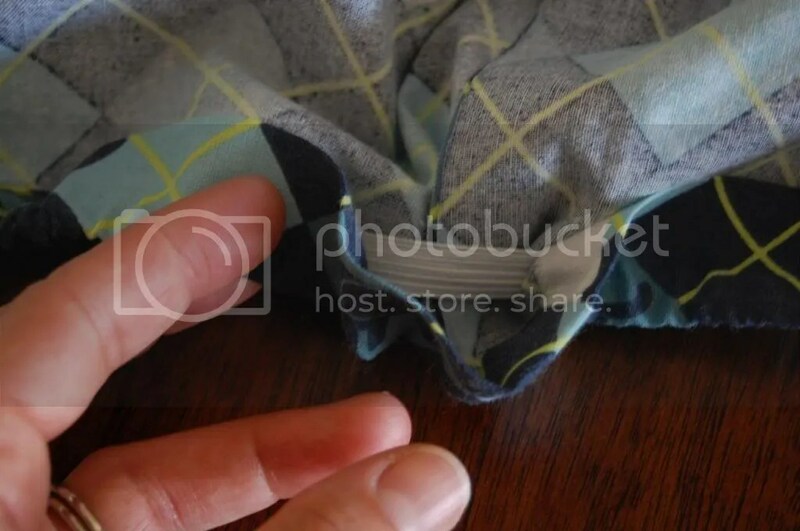 Place the damp cloth between your hot iron and 1″ hem on the fabric, press down for 10 seconds on both sides and continue doing the same thing along the perimeter of the fabric with the precut Stitch Witchery piece you are using. For the sake of more brevity, I’ve left out pictures of hemming each side but I think you get the point. 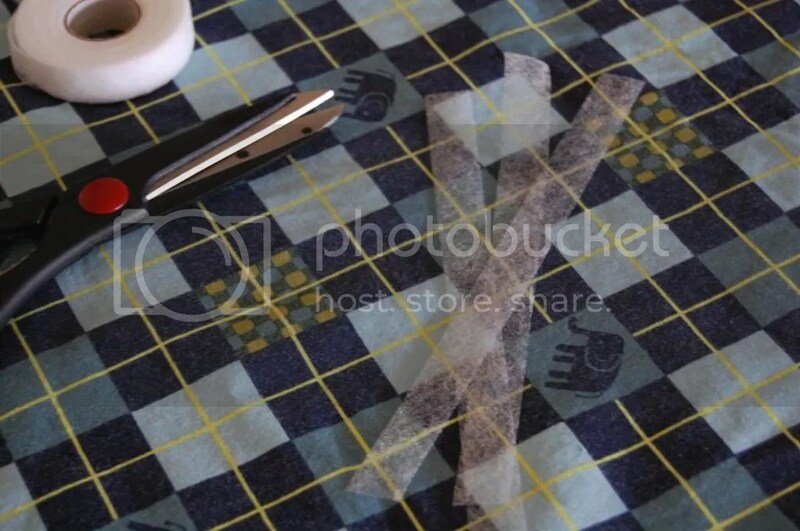 Just know that you will repeat the same process 3 more times, using the precut pieces of Stitch Witchery. This means you will use two 30″ pieces and two 14 1/2″ pieces, total when making this first hem. This is what your finished 1″ hem will look like, once you’ve ironed the Stitch Witchery into place. It’s hard to tell in this photo but the corners (from the pre-ironed hem) aren’t actually set in place. This is because the precut Stitch Witchery pieces were just long enough for all the sides, intentionally leaving out the corners (about 1″ to 2″ in length). So, don’t worry about these for now…we’ll get to that in a minute. Grab your elastic which hopefully you’ve already cut into a 52″ length. If not, now is the time to measure and cut it. 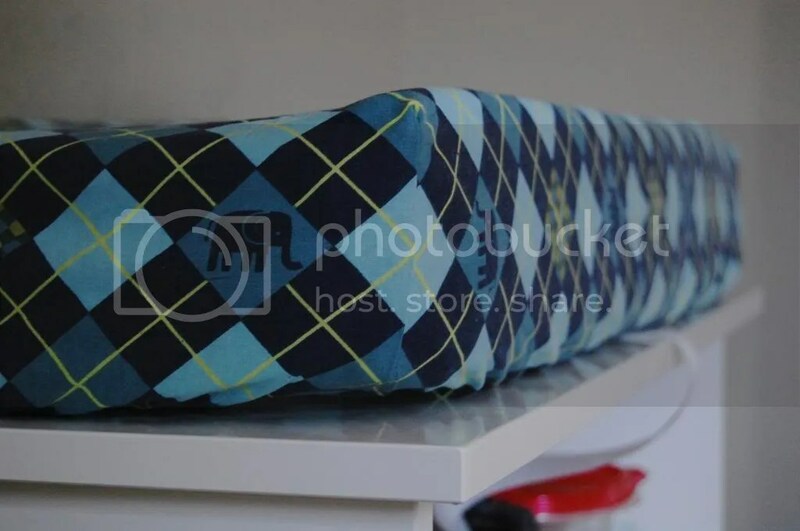 The reason I chose the wider elastic size (3/8″) instead of the smaller size (1/4″) is because after making a few covers with the smaller width, I found the 3/8″ elastic gave the cover a better shape at the end. Really, it’s just personal preference so you can use whatever size you have because the length isn’t going to be affected. Step 1: Start with a 52″ length of elastic and two large safety pins. 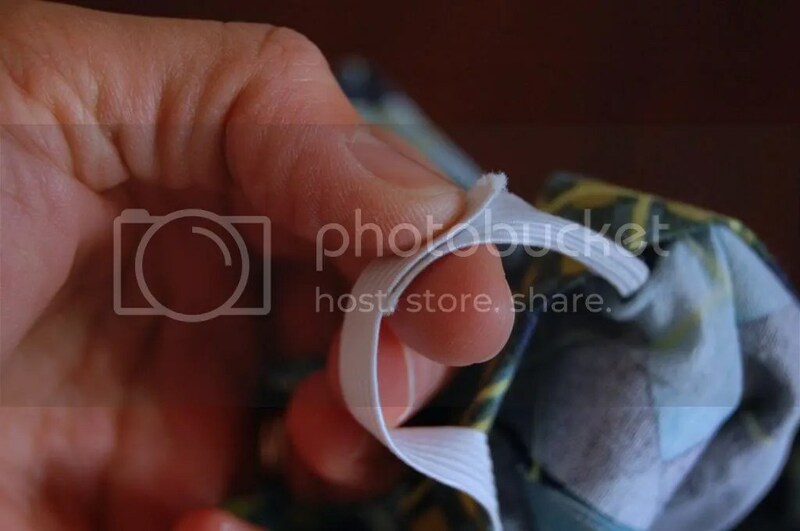 Step 2: Make a small fold on one end of the elastic and pierce through both layers with a safety pin. Repeat on the other end. Step 3: Now you have a 52″ length of elastic with two large safety pins attached on each end. Again, I’ve left out pictures of hemming each side. Just know that you will repeat the same process for each side, using the precut pieces of Stitch Witchery. You will use the last two 30″ pieces and two 14 1/2″ pieces when making this second hem. 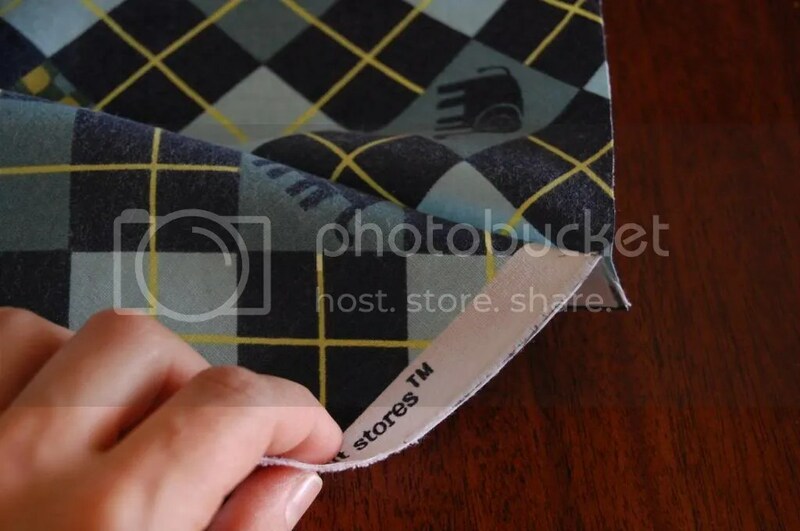 When you are ironing the hem, you are going to leave the corners without hemming. 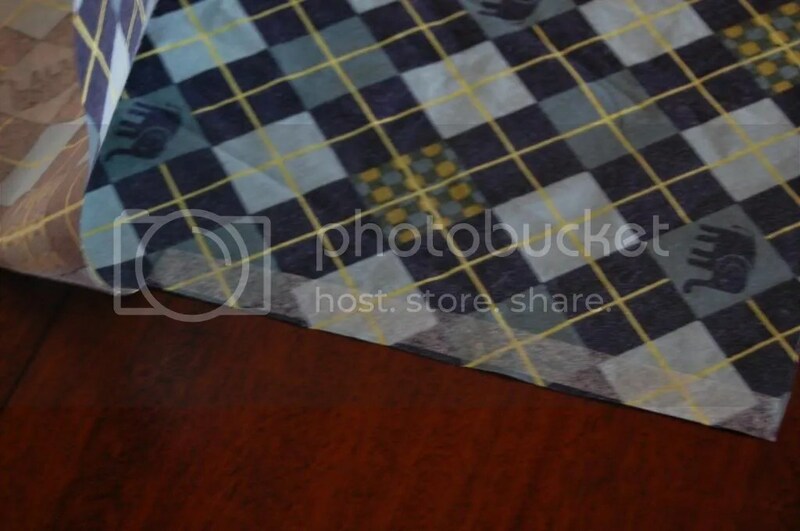 This makes sense because the precut lengths of Stitch Witchery should only extend between the corners. It’s just long enough so that you leave the corners exposed. Ok, so you’re all done with ironing the second (1 1/2″ to 2″) hem. 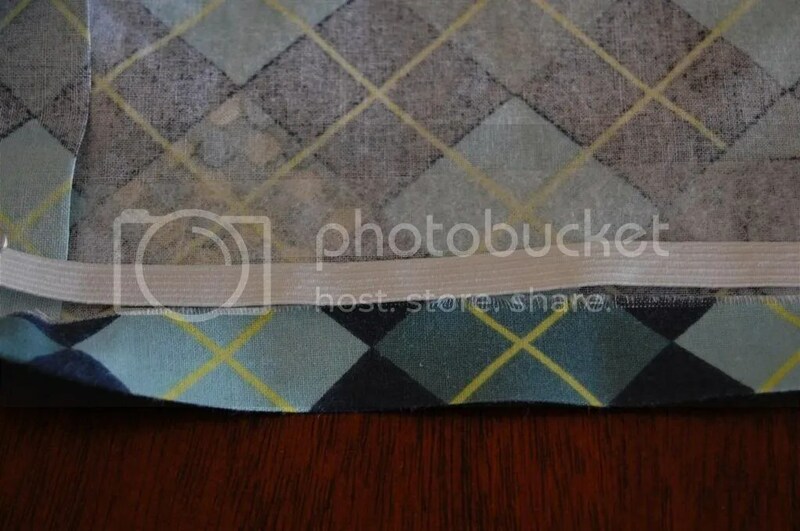 Go ahead and grab your prepped elastic and find one of the exposed corners on the cover. 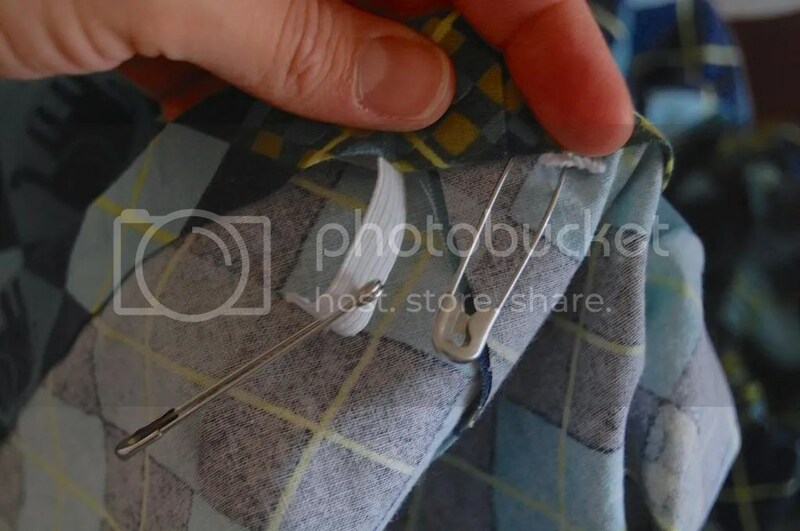 Take your safety pin and insert the elastic through the corner, into the tubing you’ve just created. The exposed corner where I inserted the elastic is just outside the frame of this picture below, to the right of my thumb. 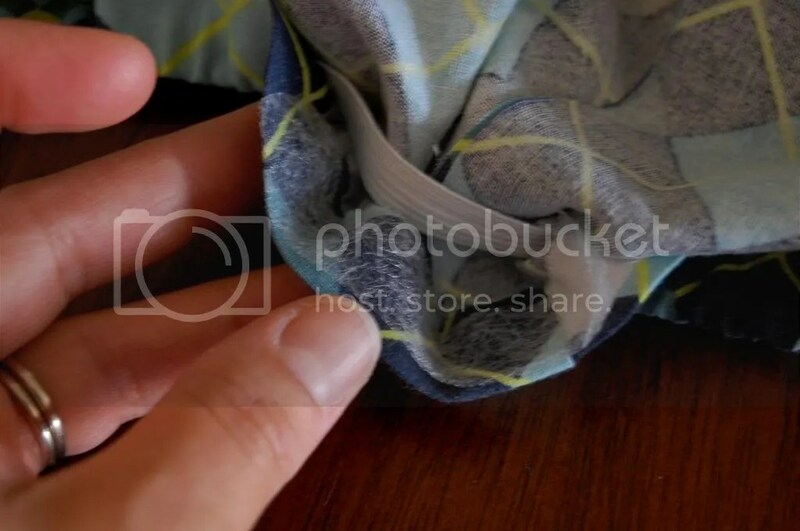 Start sliding the safety pin across the tubing, using your thumb and pointer finger on one hand (for me, this was my left hand as pictured below) to pull it gently through the tube while using your other hand to spread out the fabric as it bunches up. Continue doing this until you’ve threaded the elastic through the entire tubing. When you have finished threading the elastic, both ends with the attached safety pins should be touching, as pictured below. This means you’ve successfully threaded the elastic along the entire diameter of the cover. Remove the safety pins and make sure you don’t let go of the elastic ends. I repeat, do not let go. Otherwise you will find yourself with elastic that has slipped back inside the tubing and is lost for all eternity. Ok, it’s not really that drastic but still….just don’t let go. Hold them like pictured below, so that both ends are slightly overlapping each other. 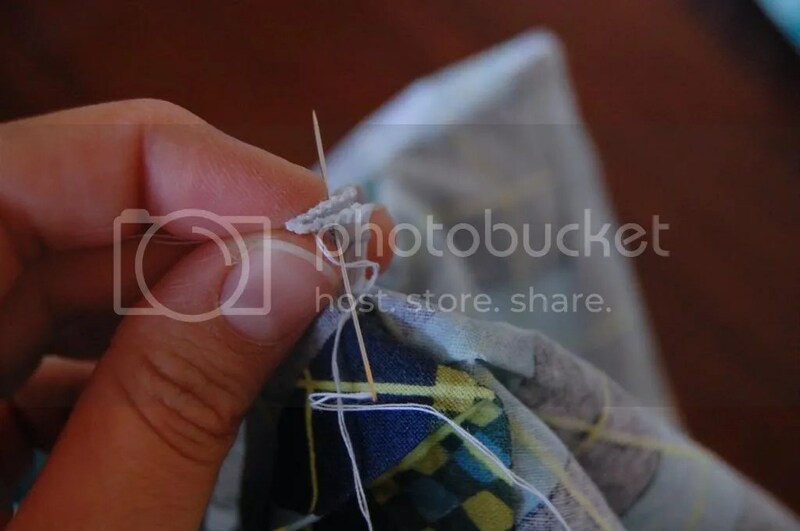 Using your prepped needle & thread, insert the needle through both layers of the elastic in the middle and pull all the way up until the knot in the thread doesn’t let you go any further. This part is much like sewing a button, but if you’ve never sewn a button that is okay…I’ll explain. You are simply pushing the needle through all the elastic, pulling up and down with the thread and repeating this across the width of the elastic. When you finish, you will have sewn together both ends of the elastic. It should be tight enough that if you were to try and pull it apart, only the elastic will give but not the actual part that’s been sewn. Below is a picture of the finished and sewn elastic ends. Trim any excess thread if you’d like. Now you can let go of the elastic! 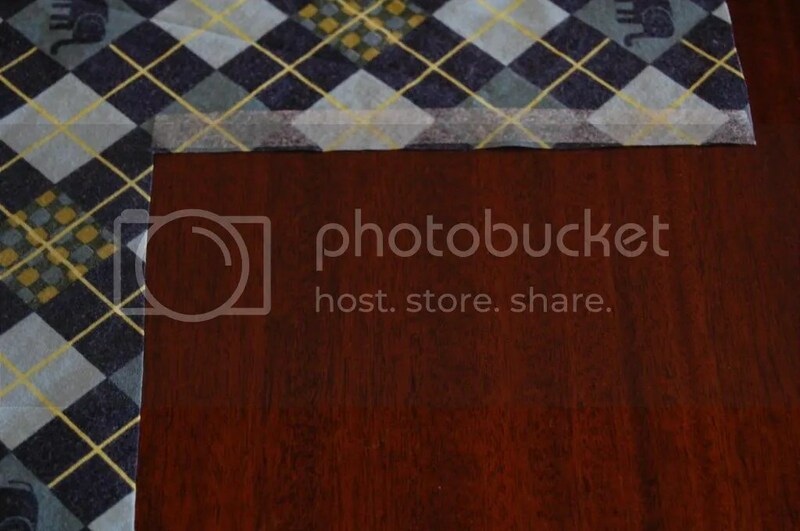 Remember the four corners you left (intentionally) exposed all along? You are finally going to close those off now. 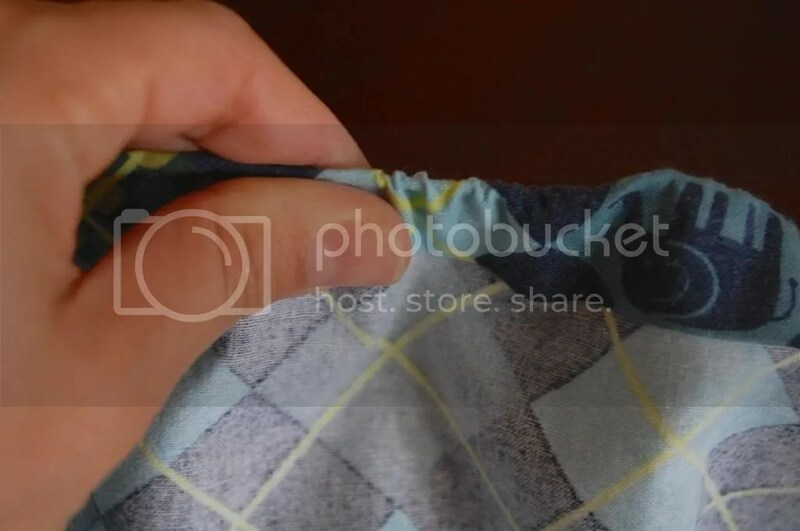 Below, you can see the elastic is inside the tubing and how it’s exposed at one of the corners. Each corner will look like this until you iron the hem down with more Stitch Witchery. This is the only part where your measurements may be a bit different so for the sake of avoiding any confusion, I left out my particular measurements. Just eyeball and measure how big of a piece you need and then, double that length. Why double? Because after making four of these covers, I realized that I would rather have the extra “insurance” by doubling up on the corners since they are thicker than just the regular hemmed parts. The picture below only shows one layer of Stitch Witchery, so do as I say and don’t do as pictured. Double it up on the corners! Iron down each corner, again making sure you use the damp cloth method as described earlier. 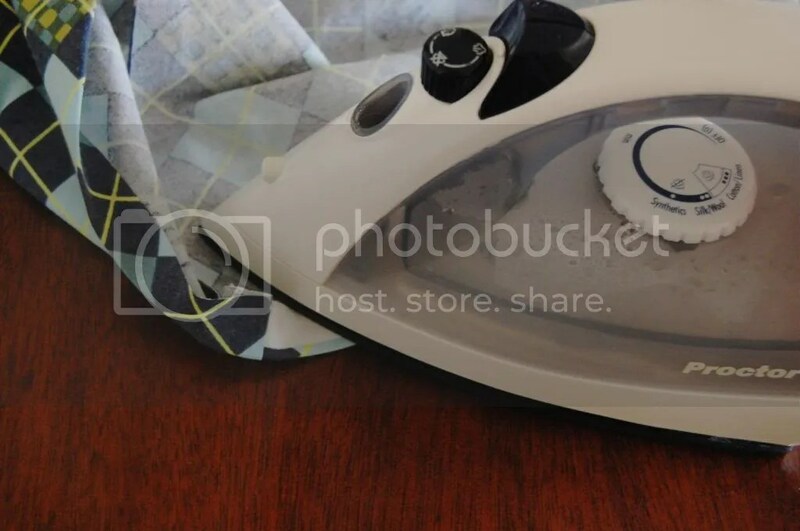 Reinforce the corner seams as much as needed, so if you need to iron them down several times go ahead and do so. Again, this picture doesn’t show the damp cloth but don’t forget to use it! Guess what? You are all done! 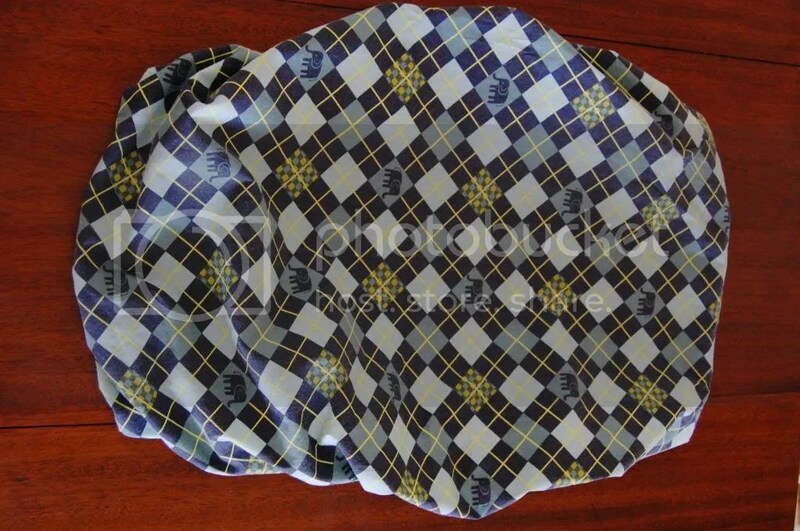 Here’s what your finished changing pad cover looks like from the bottom. And a view from the top. Enormous shower cap, anyone? 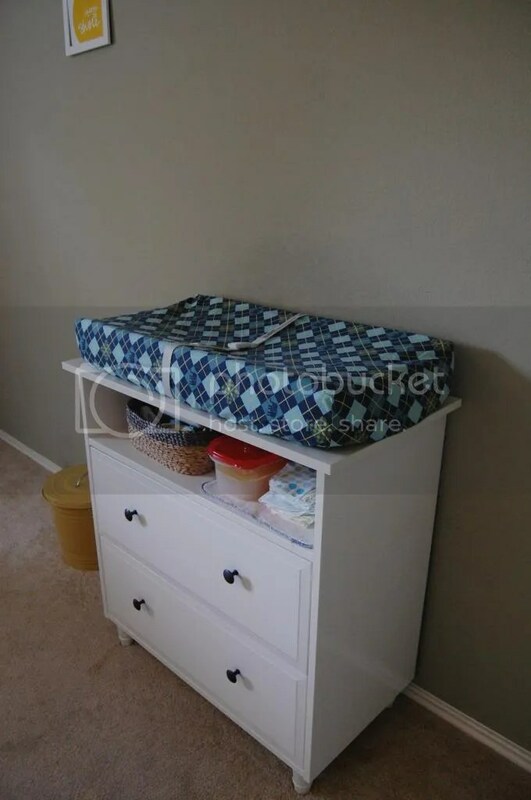 Of course, it looks much better once it’s modeled on the actual changing pad, right? Note: no baby model was included in these photos due to safety precautions. Obviously. In case you’re wondering, there isn’t anything special you need to do for the safety strap to fit. As you’ll see in a few pictures below, the edge of the cover doesn’t cover or inhibit the straps on either side. 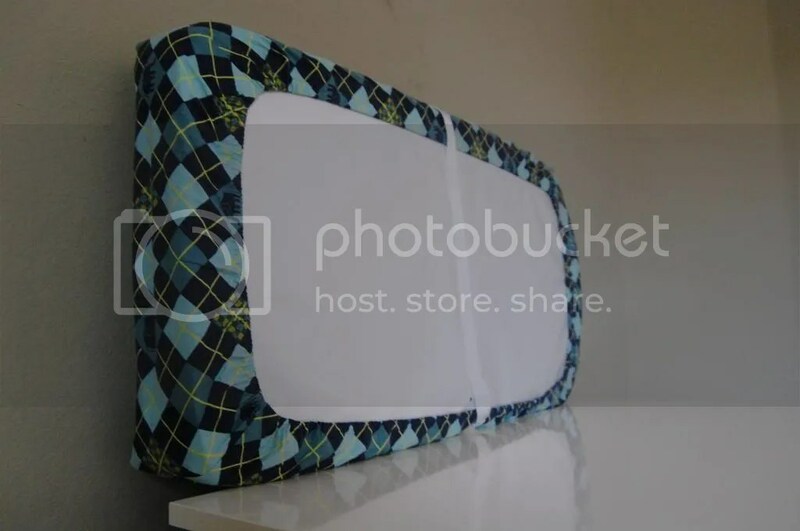 This is a standard contoured changing pad, which measures 32.5″ (length) x 16.5″ (width) x 4″ (height/thickness) and the cover fits just right. 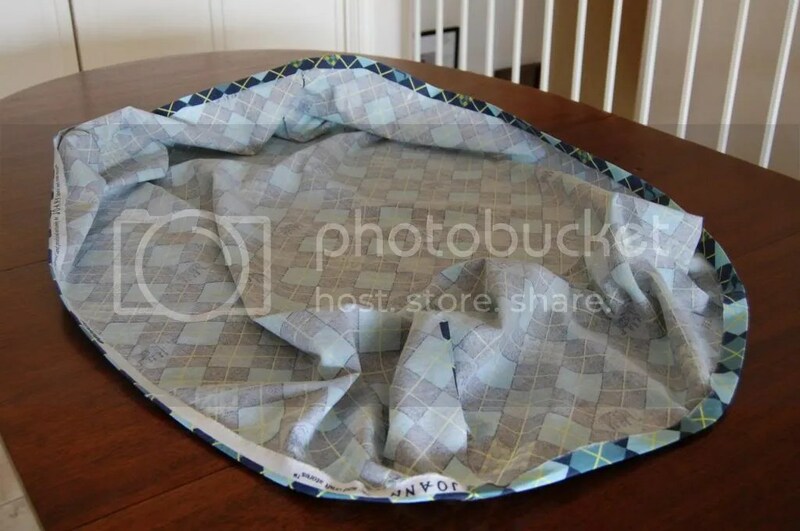 If your changing pad isn’t contoured, just make sure it isn’t any higher/thicker than 4″ or else this cover may not fit properly. See what I mean about the safety straps? 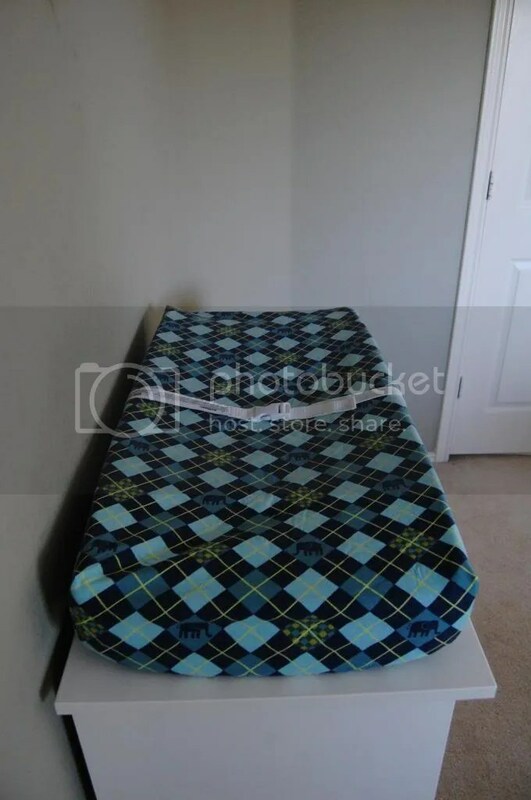 Not one bit bothered by the changing pad cover, and you can just slide them over the cover and use as normal. And that is all! You’ve made it through two very long and detailed tutorials (thank you!) 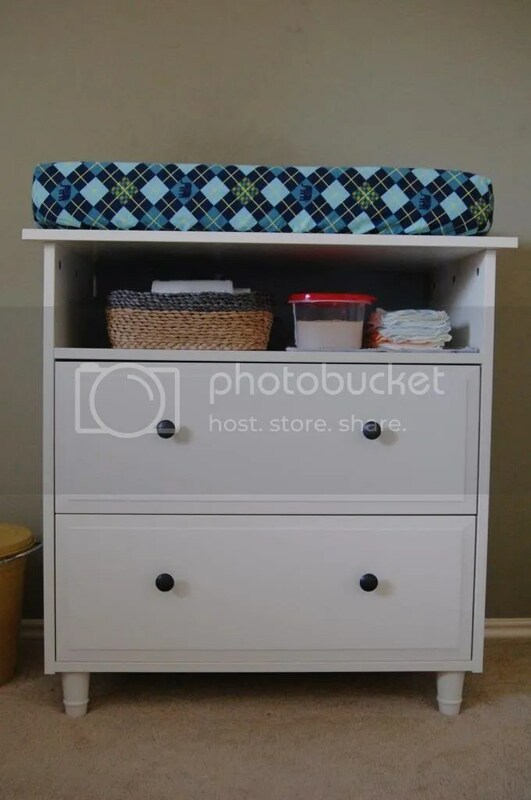 on how to make an easy changing pad cover, without a sewing machine.